after some heavy rain i noticed a soft spot next to the skylight. when i took off the inside piece, sure enough there was a small amount of water coming in. not dripping or anything, but the wood was moist. i took the skylight apart for cleaning when i purchased the camper, and there was no evidence of water damage there. perhaps when i reinstalled it something shifted or something else happened in the last year. I did reseal w/ dicor the skylight screws and seam on the roof of the camper, so i'm not actually sure how the water is getting in. thoughts? does this sound like there is a roof problem and not a skylight problem? I don't want to replace the whole skylight unit right now if it won't fix this problem. i was planning on replacing the outside top piece soon b/c it is worn. i'm dreading tarping my camper b/c it's just so ugly and having the skylight open makes my camper so much nicer to be in. but i'm living in my camper so i can't have any chance of molding. I only bought my trailer last fall and did some leak repair. However I did wrap a tarp over the entire trailer and teased everyone about my redneck trailer cover. I'm sure the proper cover can be expensive so I paid $30. But to my credit I wrapped and tied it so it was somewhat presentable. Couldn't get it off soon enough this spring. If you were physically on the roof like I was you may have disturbed something, maybe along the seem or the putty gasket around the skylight. Maybe during a dryer day put some water soluble color dye near the suspect leak and run the garden hose. Have everything inside the trailer related to that skylight removed and watch for that leak. jerryj, i can see where the water is coming from inside, but that doesn't shed any light as to where it's actually coming from on the outside...to see more i'd have to take apart the roof inside which i don't want to do. i'm drying it out now and i think the wood is fine. if i reseal the whole roof, with the paint brush and thick substance, will that likely take care of this? and I can replace the outside skylight piece. can anyone share thoughts on that? I do not know on your older unit, on the newer ones there is a skylight in the shower. A dome so taller folks don't hit their head. I have a cracked one that the new replacement is suppose to show up tomorrow. You may need to use a step ladder and inspect the side of the skylight for cracks. The cracks start at the screw edges most of the time and then run in any direction. 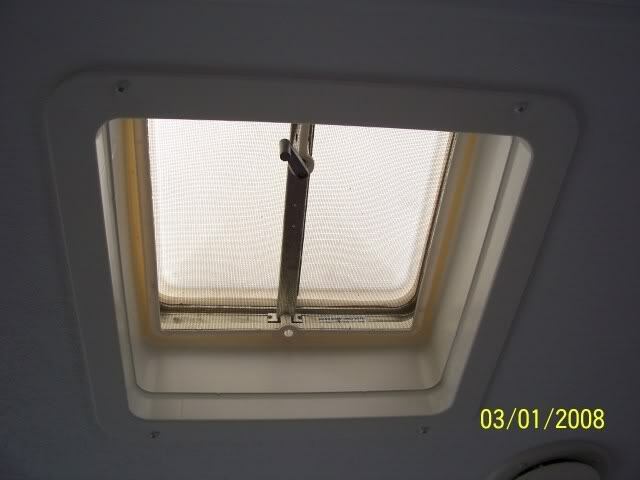 Or the bond between the skylight and the camper has separated letting the water in. I will create a "how to" post with picks when I do it. I bought my new skylight here. I bought my AC cover from them and the quality and service is good. I have not yet seen the skylight in person but expect it to be the same high quality. To do a temporary patch, I drilled a hole in the end of the crack to help stop if from spreading and used Eternabond tape to seal over the crack. There was a crack in the skylight that I patched for temp fix last year. obviously something has given way. it needs to be replaced. i'm unsure though, so maybe you can clarify, if i need to replace the whole skylight piece, or just the external piece (dome outside part). oh, my skylight is only in the main part of the camper. almost centered. I also want to reseal the whole roof. can anyone point me to a good product for an aluminum roof? i resealed w/dicor the vents and such last year. do all those have to come off before I use the roof seal? i seem to have a few other leaks that i thought were fixed last year, but not apparently. each side of the front window. these are minor but i want to prevent them from getting worse. i'm not sure what to do with these ones. i will have to find something to get me through temporarily until i can put some time into it. i never did get to remove and re-butyl and seal all the windows like i wanted to. ... and having the skylight open makes my camper so much nicer to be in. ..
Is it the crank open roof vent or the fixed skylight that has the leak? 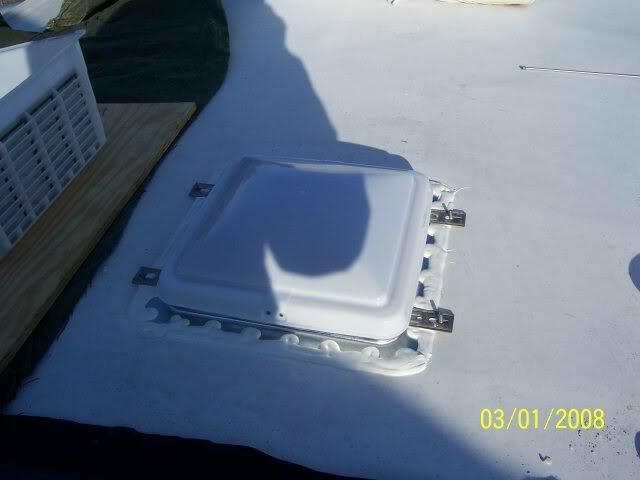 The roof vent cover, you can replace just the cover if the metal frame work is still all good. They make a few sizes of the vent covers and the hinges are different so you have to know what kind of hinge you have. . The shower dome, in this case the entire dome must be replaced. Let us know which it is you are referring too, a roof vent or a shower dome. Assuming this is a roof vent cover, if you can, a picture of the pivot hinge is the roof vent cover. Will need the dimensions of the hole in the inside of the camper the air comes through. That Dicor is supposed to be the cat's meow, However I have never used it, so I can't say yes or no. But that many people can't be wrong. 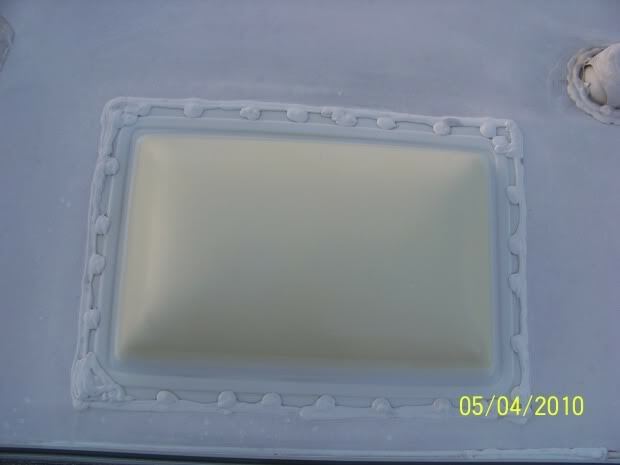 What I did was; strip the seams of the roof or where any patches were , using my putty knife/ scraper I removed old dried up putty (or whatever it was) including someone else' attempt at using some sort of silicone that was on top of the putty. it was a real mess, although it never did leak. Then used the Rust-Oleum sealing spray, makers of Tremclad paint. Remember that goofy commercial where the guys sprays his boat with a screen bottom? I think this is Rust-Oleum's version of that guy's stuff. It worked for me 100% @ $12 per spray can. I did both my seems, with two coats and there's still about 1/3 can remaining. When I sprayed that stuff you could see it fizzle right into the seams as though trying to soak in. I taped a boarder both sides of the seem and sprayed between. Then I painted the entire dimpled portion of the roof on my T1350. i have a roof vent. it opens on the outside. i can see where the water leaks to inside, but didn't find where the leak is on the outside. but the vent cover is old and has cracks, so i'm hoping just replacing that piece will do it. and i will also do the roof. i believe the dimensions are 14x14, but i haven't checked the hinges. glad to know that info before i go to order something. i'm still trying to find out though if i need to remove all the new dicor i put in when i checked out the roof vents for the water/kitchn/toilet valves (name? ), the black pipes coming up? that dicor is not even a year old, and i'd like for this to be as simple as possible. because i'm sick of repairs! The roof vent cover, you can replace just the cover if the metal frame work is still all good. They make a few sizes of the vent covers and the hinges are different so you have to know what kind of hinge you have. john, i'm assuming the metal frame is good as long as there are no cracks or severe wear..? funny story, the plastic cover piece is so old, (it was going to be replaced in the next month anyways) that when it rains or when it was snowing, there is a light mist that comes through, at no particular point at all. like having a screen porch.